P.L. Travers was with the end result. This film was going to be an interesting experience for many reasons but I'll get to that later. Pamela Travers(Emma Thompson) or Mrs. Travers to her friends is a difficult woman. For the past 20 years she has been dogged by Walt Disney to sell him the rights to her beloved character Mary Poppins. She believes that he will ruin her character, turn her into fluff as a has with Winnie the Pooh and Peter Pan. Unfortunately with a lack of funds Mrs. Travers has to entertain the notion that she must hand over this treasured piece of fiction to ensure she won't lose everything. 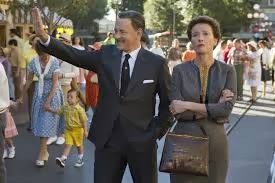 Saving Mr Banks is filled with wonderful performances that give us an insight into what happened all those years ago. Spliced in between the events with Walt Disney(Tom Hanks) and Mrs. Travers is a heart-warming story about the relationship between Pamela and her father(Colin Farrell) who is clearly the figure in her life who inspired her. As we go through the film we learn all about the genesis of Mary Poppins, Mrs. Travers's love for her father and the trouble Walt Disney had trying to translate the magic of the book to the big screen. I dug Saving Mr Banks, as I said before there is a lot going for this film talent-wise. Tom Hanks, Emma Thompson, Paul Giamatti, Colin Farrell and Ruth Wilson to name but a few. The character I was interested the most in the development was surprisingly Colin Farrell's character (Travers Robert Goff). Every time Colin Farrell wasn't on-screen I found myself wishing he was. He gave an absolutely stunning performance as the complex and broken father to Pamela. With the other characters it was the usual affair, actors pushing for Oscars because they know this is a film built for the Oscar season. Tom Hanks is his usual affable self and Emma Thompson plays an uptight, proper English lady. The film is one of the more well rounded Oscar contenders that I have seen recently,look at my Gravity review to see what I think of other films that are going for Oscars next year.